Ruth Galloway,a forensic archaeologist,goes to Italy at the request of a Italian colleague (and a former one-night stand). Bones have been found at an excavation that raise a lot of(historical)questions. 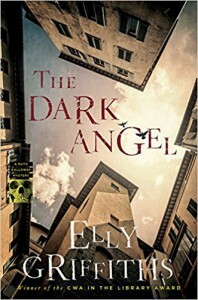 While Ruth stays in a medieval village in the Lazio region,she is confronted with the strange behaviour of certain characters and of course,murder. This is the 10th book in this series and as with all series,the quality is somewhat variable. The mystery of the Dark Angel feels like a frame story to the story of Ruth's relationship with the father of her daughter,a married D.I.,who's wife is pregnant but perhaps not by him(on/off,on/off, I want you,no,I don't....)Perhaps closure of this particularly relationship might be a good thing for both the characters and for the storyline.